We, the hundreds of East Yard Communities for Environmental Justice members from East LA, Southeast LA and Long Beach, will not support forcing our communities to pay a tax to indefinitely fund the environmental racism that has affected us for generations. We repeat, WE WILL NOT SUPPORT FORCING OUR COMMUNITIES TO PAY A TAX TO INDEFINITELY FUND THE ENVIRONMENTAL RACISM THAT HAS AFFECTED US FOR GENERATIONS. Unless equity and meaningful public participation are a fundamental part of all funding and planning, for all transportation projects/policies/measures/propositions or otherwise, any effort will reinforce and reproduce the injustices we have been fighting for generations. While Measure M promises to make everyone’s commute better, our communities face the threat of increasing contamination from fossil fuel trucks and cars, while others will get cleaner air in their communities through public transportation and active transportation investments. We already carry a disproportionate toxic burden in the region, with 8 freeways (10, 710, 60, 5, 105, 91, 405, TI Freeway) in our communities handling local, regional, interstate and international traffic. We already carry a disproportionate toxic burden for the nation, with the Ports in our communities handling 40% of the nation’s imported goods, which look like 40,000-60,000 truck trips in our communities daily, along with multiple railyards pushing trains from our communities out to the rest of the nation. Our communities have carried a toxic burden for the Western United States, resulting in Exide battery recycling poisoning thousands of East LA and Southeast LA families, over multiple generations. The City of LA has been threatening our communities for over a decade with the proposed toxic SCIG (Southern California International Gateway) railyard project, an environmentally racist project which would serve to increase profits for a private company and service goods movement for companies shipping overseas and across the country. State planning is upholding the status quo, and the status quo is environmentally racist. We refuse to disproportionately absorb the negative impacts of State and private projects that include “local hire” policies that create jobs for Orange County residents while leaving our communities to suffer extreme unemployment. While other parts of the County benefit, Measure M represents an increase in tax and toxic emissions for our communities.We are not here for that anymore. If Measure M is approved, our lives are at risk, literally. The toxic exposures in our communities, especially diesel particulate matter, already compromise our health, resulting in respiratory illnesses, cancer and premature death. What we have seen from transportation agencies (Metro, CalTrans) is antiquated transportation ideas (freeway expansion) and resistance to community leadership. For 4 years we have battled CalTrans to study Community Alternative 7, a community generated and community preferred alternative for the I-710 Project (710 from Long Beach to East LA). After getting some traction with Metro, just this last week we learned that one of the viable options for ensuring freight trucks are zero emissions, a catenary system, has been cut out of the project analysis. The claim that these entities are trying to be “technology neutral” is untrue since they are simply continuing a long history of excluding community based alternatives. When we look at the SR-710 (aka the 710 Tunnel) project, East LA was virtually excluded from the scoping process and community members had to fight to participate in the environmental review process after finding out the project threatens to displace businesses and compromise community health with an increase in toxic vehicle emissions. With our opposition to Measure M, we know we risk straining relationships (political and otherwise) that have already been strained through our unrelenting struggle for justice on other issues. We also understand that in the past our communities have already been sacrificed in the service of maintaining political relationships or under the assumption that political favor could be leveraged in the future. When we envision moving forward the long struggle for justice for our communities, these types of political games and crony capitalism amongst elected officials, agencies and non-profit organizations, is not part of this struggle. In many ways, this is what has allowed for injustice to be maintained. Some might wonder if we did enough to advocate and shape Measure M. Like our communities, our organization is under resourced and over burdened. Looking at our struggles and victories over the last year and half, when we were first contacted about the “Measure R2 strawman”, no one can say we haven’t been hard at work fighting for justice for our communities. We appreciate efforts by Supervisor Solis to support Community Alternative 7 and attempt to move the Gateway COG to be more responsive to community priorities on multiple projects and during the Measure M process. We appreciate Investing in Place and EnviroMetro for being responsive to our input around equity and mandatory zero emissions for freight investments, amongst other priorities. Before Measure M, we have created grassroots, bottom up solutions to transportation issues in our communities and have faced fierce opposition from CalTrans, Metro and the Gateway COG, so when allies engage us with open ears we are especially appreciative. Unfortunately, we also saw the writing on the wall, with the lack of responsiveness to early input on the measure. We saw it again with efforts to get the Metro Board to be responsive to our communities on the I-710 project, which were ultimately undermined by the City of LA and the Gateway COG. Perhaps this acquiescing to the Gateway COG was an attempt by LA Mayor Eric Garcetti to win favor that could payoff in the form of Measure M support, which failed given the Gateway COG’s opposition to Measure M. Most recently, we saw Mayor Garcetti visit the Commerce City Council, attempting to get them to reverse their opposition to Measure M with appeals to unity across the region, even floating the idea of Commerce hosting water polo games for the 2024 Olympics. This fell flat when we reminded the council that we had to sue the City of LA because their SCIG project was going to do train maintenance in the City of Commerce, with no plans to mitigate toxic emissions. The unity Mayor Garcetti mentioned was not felt when we successfully defeated the City of LA in court and they decided to spend hundreds of thousands dollars more to appeal the case. We engaged in a 3-month education and dialogue process with our members across the sub-region. At our membership meetings, we came to consensus on opposition to Measure M. This recommendation was taken to our Board of Directors, made up of our membership, and our opposition to Measure M was solidified on September 28, 2016. Measure M is a regressive tax. Regressive taxes result in lower income families paying a disproportionately higher percentage of their income, compared to higher income individuals. Measure M has no “sunset,” meaning it will continue with no end unless a different measure is passed in the future to end it. Given the amount of money and political will required to pass a measure in the County, it is virtually impossible for low income communities of color, the communities most negatively impacted by transportation projects in the region, to remove the tax once it is approved. Measure M lacks equity in planning and implementation. It continues a status quo in planning, resulting in a disparity in how funds would be collected and distributed. Claims of “fair” or “equal” funding schemes only work to uphold the legacies of environmental racism. We support zero emissions freight. We support equity planning and meaningful community involvement. We support genuine “local hire” guarantees. We support a change in leadership at the Gateway COG. 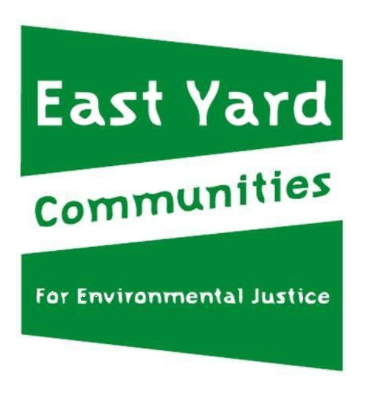 Nosotros, las centenas de miembros de East Yard Communities for Environmental Justice del Este de LA, Sureste de LA y Long Beach, no apoyaremos la imposición forzosa de un impuesto a pagar en nuestras comunidades para financiar de manera indefinida el racismo ambiental que ha perjudicado a varias de nuestras generaciones. Repetimos, NO APOYAREMOS LA IMPOSICIÓN FORZOSA DE UN IMPUESTO A PAGAR EN NUESTRAS COMUNIDADES PARA FINANCIAR DE MANERA INDEFINIDA EL RACISMO AMBIENTAL QUE HA PERJUDICADO A VARIAS DE NUESTRAS GENERACIONES. A menos que la equidad y la participación significativa del público formen parte fundamental de toda financiación y planificación, para todo proyecto/política/medida/propuesta de ley referente al transporte o semejante, toda y cada una de las gestiones reforzarán y reproducirán las injusticias contra las que han estado luchando nuestras generaciones. Mientras que la Medida M promete mejorar la movilización urbana para todo el pueblo, nuestras comunidades enfrentan el riesgo del incremento de contaminación de camiones y autos de combustible fósil, mientras que las otras comunidades gozarán de aire más limpio mediante las inversiones en transporte púbico y transporte activo. En la región, nosotros ya cargamos con el peso nocivo y desproporcionado que incluye 8 carreteras (10, 710, 60, 5, 105, 91, 405, TI) en nuestras comunidades, lidiando con el tránsito a nivel local, regional, interestatal, e internacional. Nosotros ya cargamos con el peso nocivo y desproporcionado en nombre de toda la nación, con Puertos en nuestras comunidades que manejan el 40% de la importación de bienes y mercancías que ingresan a la nación, cuya realidad representa 40,000-60,000 viajes de camiones diariamente en nuestras comunidades, aunado a una multitud de yardas ferroviarias desplazando trenes de nuestras comunidades al resto de la nación. Nuestras comunidades han cargado con este nocivo peso en nombre de los Estados Unidos del Oeste, conllevando al envenenamiento de miles de familias en el Este de LA y Sureste de LA por parte de la compañía de reciclaje de baterías Exide, por varias generaciones. La Ciudad de LA tiene amenazadas a nuestras comunidades por más de una década con la tóxica propuesta del proyecto de la yarda ferroviaria SCIG (Southern California International Gateway/Entrada Internacional del Sur de California), un proyecto de racismo ambiental cuyo fin es mejorar las utilidades de una compañía particular y favorecer el movimiento de mercancías para las compañías de embarques al extranjero y al resto de la nación. El departamento de planeación estatal respalda el statu quo, y el statu quo es el racismo ambiental. Nos reusamos a absorber desproporcionadamente los efectos negativos del Estado y proyectos de iniciativa privada que incluyen las normas de “contratación local” que generan empleos para los habitantes del Condado de Orange mientras que dejan rezagadas a nuestras comunidades a sufrir del desempleo extremo. Mientras que otras partes del Condado se ven beneficiadas, la Medida M representa un incremento en el IVA y en emisiones nocivas en nuestras comunidades. Ya no se cuenta con nosotros para eso. De ser aprobada, la Medida M pone en riesgo nuestras vidas – literalmente. La exposición a sustancias tóxicas en nuestras comunidades, especialmente a partículas de diesel, ya afectó nuestra salud, conllevando a enfermedades respiratorias, cáncer y muerte prematura. Lo que hemos visto por parte de entidades de transporte (Metro, CalTrans) son ideas anticuadas del transporte (expansión de carreteras) y resistencia ante el liderazgo comunitario. Hemos batallado ya 4 años para que CalTrans estudie la Alternativa Comunitaria 7, una alternativa generada y deseada por la comunidad respecto al Proyecto I-710 (710 de Long Beach al Este de LA). Luego de haber influido un poco en Metro, la semana pasada nos enteramos que una de las opciones viables para garantizar el uso de camiones de carga de cero emisiones, la opción catenaria (trolebús), ha sido eliminada del proceso de análisis del proyecto. Alegan que estas entidades están tratando de tomar una postura “neutral respecto a tecnologías”, lo cual no es acertado ya que simplemente están dando continuidad a un extenso historial de exclusión de las alternativas comunitarias populares. Cuando vemos el proyecto SR-710 (alias el Túnel 710), prácticamente excluyeron el Este de LA en el proceso exploratorio y los miembros de la comunidad tuvieron que luchar para participar en el proceso de revisión ambiental luego de enterarse que el proyecto amenaza con desplazar negocios y compromete la salud comunitaria con un incremento en la emisiones vehiculares nocivas. Al oponernos a la Medida M, sabemos que arriesgamos el poner en juego nuestras conexiones (políticas y otras) que ya han estado en juego antes por nuestra incansable lucha por la justicia tocante a otros asuntos. También entendemos que en el pasado nuestras comunidades han cargado con el sacrificio en aras de mantener relaciones políticas o bajo la suposición de que los favores políticos pudieran favorecernos a futuro. Cuando prevemos los avances de nuestra larga lucha por la justicia en nuestras comunidades, este tipo de juegos de política y camaradería capitalista, entre funcionarios electos, agencias y organizaciones sin fines de lucro, no forma parte de la lucha. En distintas formas, esto es lo que ha permitido que la injusticia prevalezca. Algunos se han de preguntar si hemos hecho lo suficiente por abogar y moldear la Medida M. Al igual que nuestras comunidades, en nuestra organización los recursos son escasos y la carga abrumadora. Al dar un vistazo a nuestros estragos y victorias en el año y medio que acaba de transcurrir, cuando por primera vez se nos avisó acerca de la “Medida R2 strawman”, nadie puede decir que no hemos estado trabajando duro por la justicia en nuestras comunidades. Reconocemos con aprecio los intentos del Supervisor Solís en apoyo a la Alternativa Comunitaria 7 y el intento de influir en el Concilio de Gobiernos de las Ciudades de Entrada para que fuesen más sensibles ante las prioridades de la comunidad en varios proyectos y en el proceso de la Medida M. Le agradecemos a Investing in Place y EnviroMetro por su sensibilidad ante las opiniones tocantes a la equidad y la obligación de cero emisiones al invertir en los camiones de carga, entre otras prioridades. Anterior al a Medida M, nosotros hemos elaborado soluciones arraigadas en la comunidad ante las gestiones de transporte en nuestras comunidades y hemos enfrentado una oposición feroz por parte de CalTrans, Metro y el Concilio de Gobierno de las Ciudades de Entrada, así que nos sentimos sumamente agradecidos cuando un aliado participa con nosotros con una mente abierta. Desafortunadamente vimos también, a plena vista, la falta de sensibilidad ante las opiniones iniciales respecto a la medida. La vimos también en los intentos por conseguir que la Directiva de Metro fuese más sensible ante nuestras comunidades en el proyecto I-710, los cuales finalmente fueron socavados por la Ciudad de LA y el Concilio de Gobiernos de las Ciudades de Entrada. Quizás esta aquiescencia con el Concilio de Gobiernos de las Ciudades de Entrada fue un intento por parte del Alcalde Eric Garcetti a manera de conseguir el favoritismo que resultaría en el apoyo a la Medida M, lo cual fue un intento fallido ya que dicho Concilio se opuso a la Medida M. Aún más recientemente, vimos al Alcalde Garcetti en su visita al Concilio de Ayuntamiento de Commerce, intentando conseguir que se retractaran de su oposición a la Medida M haciendo un llamado a la solidaridad de la región, incluso oscilando la idea de que Commerce fuese la cede de partidos de polo para las Olimpiadas 2024. Todo se quedó corto cuando le recordamos al Concilio que habíamos entablado una demanda en contra de la Ciudad de LA porque el proyecto SCIG iba a tener sesiones de capacitación de manutención en la Ciudad de Commerce, sin plan alguno para mitigar las emisiones de sustancias tóxicas. La solidaridad que mencionaba el Alcalde Garcetti no se percibió cuando nosotros victoriosamente vencimos a la Ciudad de LA ante un juez y ellos decidieron gastar cientos de miles de dólares para apelar el dictamen. Condujimos un proceso informativo y de diálogo de 3 meses con nuestros miembros a lo largo de la subregión. En las reuniones de membresía llegamos a un consenso de oposición a la Medida M. Esta recomendación fue presentada ante nuestra Mesa Directiva, compuesta de miembros de la organización, y el 28 de septiembre, 2016 se ratificó nuestra oposición a la Medida M.
La Medida M es un impuesto regresivo. Los impuestos regresivos tienen como resultado el que las familias de bajos recursos tengan que pagar un porcentaje desproporcionadamente más alto por sus ingresos, comparado con los individuos con mejores ingresos. La Medida M no tiene fecha de vencimiento, es decir que continuaría vigente indefinidamente a menos que otra medida sea aprobada que ponga fin a ésta. Tomando en cuenta la inversión monetaria y política que se requiere para la aprobación de una medida en el Condado, viene siendo prácticamente imposible para las comunidades de color de bajos recursos –siendo las comunidades que se ven principalmente perjudicadas por los proyectos de transporte en la región– el eliminar un impuesto una vez que haya sido aprobado. La Medida M carece de equidad en su planificación e implementación. Le da continuidad al statu quo en la planificación, cuyo resultado es la disparidad en la manera en que se recolectan y distribuyen los fondos. El que el complot financiero declare actuar “justamente” o “con igualdad” simplemente contribuye a la preservación del legado de racismo ambiental. Nosotros apoyamos el transporte público. Nosotros apoyamos el transporte activo. Nosotros apoyamos el transporte de carga de cero emisiones. Nosotros apoyamos la equidad en la planificación y la participación significativa de la comunidad. Nosotros apoyamos el garantizar una auténtica “contratación local”. Nosotros apoyamos el cambio en el liderazgo del Concilio de Gobiernos de las Ciudades de Entrada. Nosotros apoyamos la autodeterminación comunitaria. Nosotros apoyamos todo esto y nada menos.